As cool as I thought it was to see a new version of Gaea’s Blessing in Dominaria, the original art will always be what I think of. It’s the original and iconic, and in addition, Rebecca Guay’s style is very unique and contrasting with most of Magic’s other artists. I really think that a franchise like Magic, whose premise explicitly involves different worlds and settings every few months, could afford to have a little more variety in art style. Maybe it even should. Gaea’s Blessing is a good reason why the kind of decks that mill all or most of the opponent’s library in a couple of shots (think Helm of Obedience or Traumatize) don’t dominate in larger settings. You don’t even need to have more than one in the deck, although it does feel bad when you draw it. It also looks superficially like a solid option against storm decks with Brain Freeze, but storm is so fast and dangerous that you might want to go with a more aggressive option like Eidolon of the Great Revel, or anything else which hurts them rather than merely preventing them from hurting you. Its first famous old-school outing was in an interesting deck designed by Adrian Sullivan, where he used multiple Blessings to effectively resculpt his library over the course of a game depending on what his opponent had done and what he had used. That took a really long time, of course, so you may not have the patience for that; however, it certainly becomes better at straightforward recursion when you have fewer cards in your library, and there is probably at least one combo still out there that can take advantage of that. The other day my opponent played Primal Command and it sparked an epiphany, Green is the color with access to graveyard recycling. I had always ran Elixir of Immortality or the Eldrazi titans as my answer to mill decks. Although I’m a Golgari fanboy, I wouldn’t mind seeing this kind of ability more often. On to the card itself. As mentioned when we covered Regrowth a few weeks back, returning cards is almost universally good. The problem is that since the cards are shuffled away you have no control when or if you see the cards again. Basic TCG 101 here but fattening your library is usually a bad idea as it decreases the chance of drawing the cards you need. The extra card draw is appreciated though. I suppose you can combine this card with Leveler for a mini- Doomsday effect. meh. When I reviewed Muldrotha, I mentioned that your graveyard is a powerful tool. In my mind a card is more useful in the discard pile than in your deck. Another thing to consider is outside of casual groups, mill isn’t a very popular strategy. Not only that but the aforementioned Elixir of Immortality is the better card to sideboard against mill and Nature’s Spiral is probably the better choice in Limited and Standard. 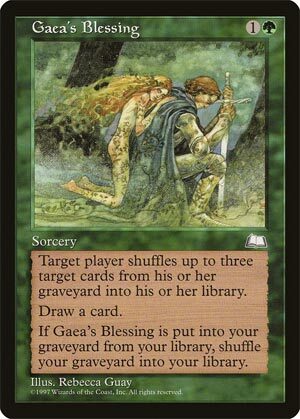 Another old reprint in Dominaria, Gaea’s Blessing is an interesting cross between a hate card for graveyard strategies, recursion for your own deck, and hate against mill as a strategy; cantripping makes this a better play overall, but there’s no real denying that Gaea’s Blessing is a pretty niche card overall. Mill as a deck is underpowered and erratic, so there’s little reason to specifically prepare for the strategy, and there are more powerful methods to hate out graveyard strategies, such as Rest in Peace, Leyline of the Void, and Faerie Macabre. It can serve several roles, but only decently, and it’s probably better to go for more precise and powerful tools.